My mother has been asking me to make a raspberry pie for as long as I can remember. I’ve made many other raspberry desserts but, until now, never quite got around to making a pie. Then Mom took a picture of a raspberry pie that she, recently, made and I thought it was so pretty, I just had to give one a try. You see, Mom is an amazing baker who does not realize just how talented she is. 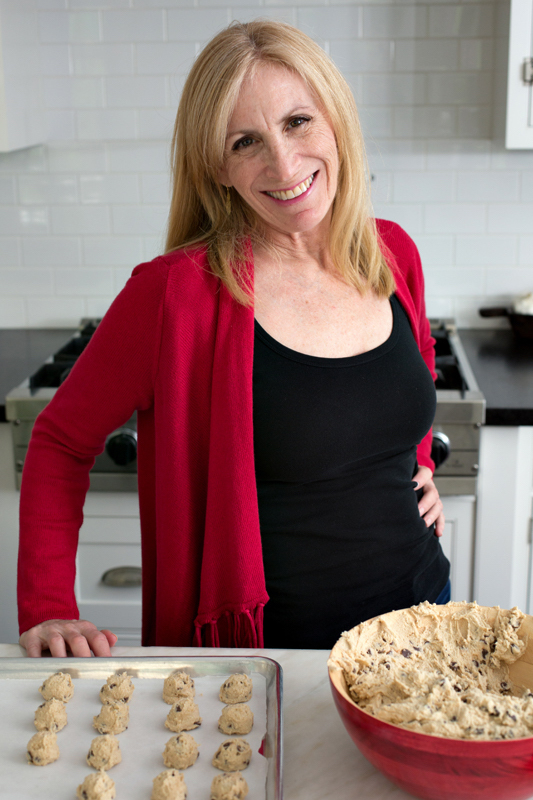 I don’t know why this is because I grew up watching her make Nana’s Butter Cookies and gorgeous pies. Mom’s raspberry pie included gelatin but I decided to go in another direction. I used the base of Mom’s Strawberry Pie for my pie, which meant lining the bottom of the crust with a thin layer of cream cheese. After cooking raspberries on the stove with some lemon juice, sugar and cornstarch, I strained the mixture and allowed it to cool. Folding the cold raspberry mixture into lightly sweetened whipped cream was a breeze and made the cream pop in both flavor and color. 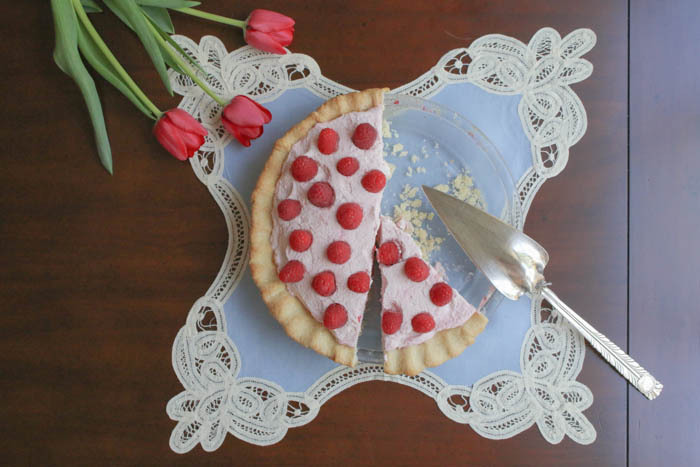 Fresh raspberries are placed over the cream cheese as well as on top of the chiffon layer. 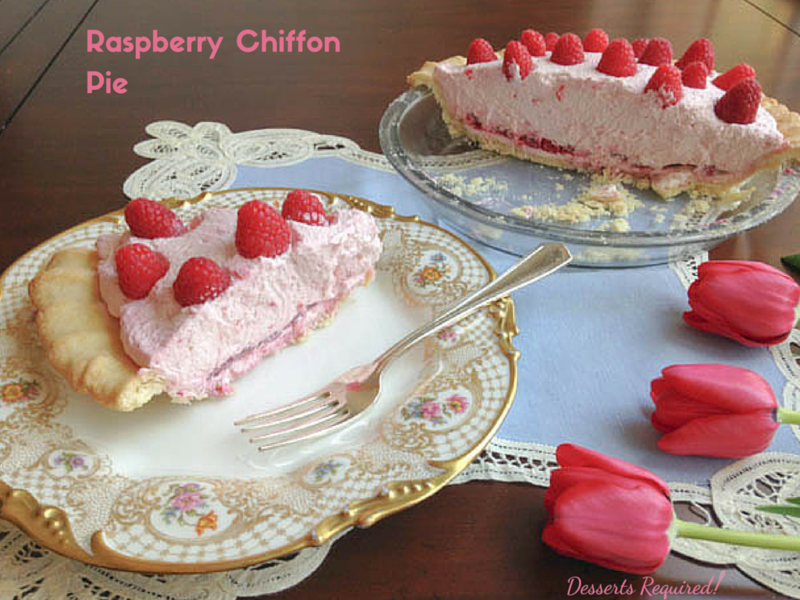 You are pretty much guaranteed to have one of the best raspberry experiences possible with this Raspberry Chiffon Pie. Just don’t wait as long as I did to make one. Combine the flour and sugar in a food processor. Pulse on/off to mix. Add the butter and pulse on/off until the mixture is the consistency of coarse meal. While using the pulse on/off button, add the ice water 1 tablespoon at a time and mix just until the dough becomes a ball. The dough should not be wet and sticky. Transfer the dough to a piece of wax paper. Flatten the dough into a disc and wrap the in the wax paper. Refrigerate for at least one hour. Preheat oven to 375º. Set aside 9” pie plate. Roll out the dough, either on a lightly floured surface or between sheets of wax paper, so that it is large enough to fit into pie plate with a small overhang of pie crust. Spray the pie plate with nonstick cooking spray. Transfer the dough to the pie plate and fold the extra dough under the top. Flute the edge with your fingers or a fork. Prick the pie crust bottom and sides with a fork and freeze the pie crust for 10 minutes. Place 2 - 6 ounce containers of raspberries, sugar, cornstarch and lemon juice in a medium saucepan. Cook over medium heat until the mixture is thick and translucent, stirring constantly. Place a fine mesh strainer over a large bowl. Pour the raspberry mixture into the strainer and press the juice out, leaving the raspberry seeds in the strainer. Discard the seeds. Refrigerate until cold. Cut 6 ounces of raspberries in half. Place them over the cream cheese. Whip the cream and confectioners sugar until stiff peaks form. Gently fold the cold raspberry mixture into the cream. 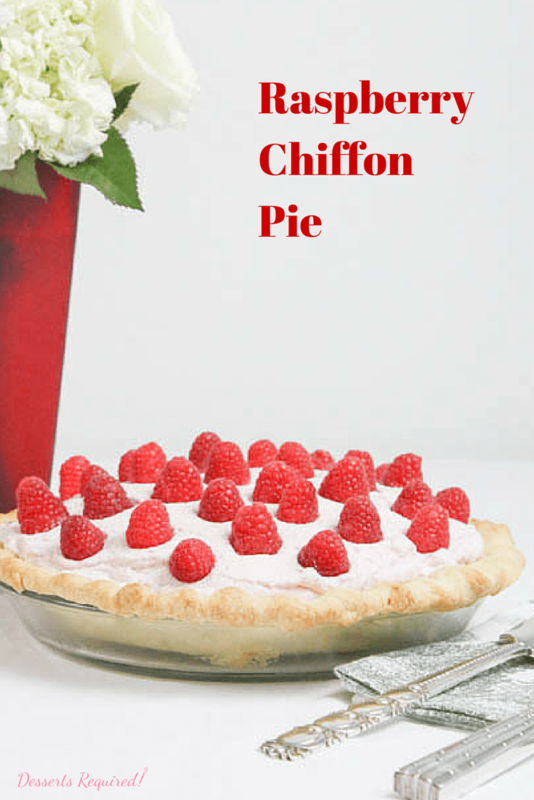 Transfer the chiffon layer onto the raspberries in the pie plate. Spread evenly. Top with the remaining 6 ounces raspberries. The crust and cream cheese may be put together one day in advance. The raspberries over the cream cheese, raspberry layer and whipped cream should be prepared the day that the pie will be served. OMG!!!!!!!!!!!!!!!! Thank yous to your Mama. Oh, this looks so delicious and refreshing. Can’t wait for sweet raspberries to find their way into our stores. I think you are going to LOVE this one and, fortunately, the raspberries will be super sweet in the near future! Betsy, beautiful presentation here! Like Mary said, I’m looking forward to raspberry season too. Pinned! Thanks so much, Brooks! I can’t wait for your feedback once you give this a try!